Fennel. Foeniculum vulgare. A tall, ferny, elegant herb with leaves and seeds that, in autumn, are worth harvesting as they’re very useful in cooking. It self-seeds obligingly and I think it is an attractive and useful plant. The rabbits enjoy the occasional frond too. But even better than me liking it, the Swallowtail butterfly – Papilio machaon – loves it. 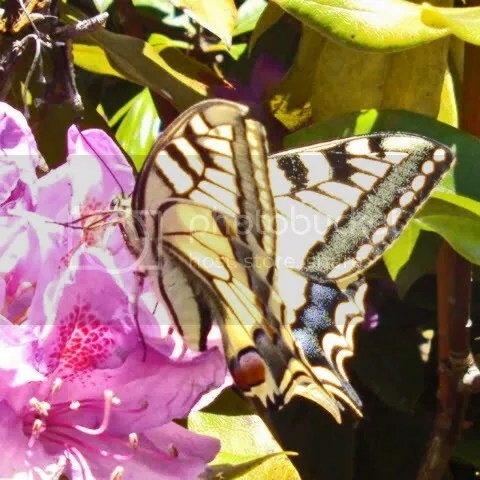 Earlier in the summer, I was rather excited about a swallowtail butterfly that was enjoying our rhododendron flowers. Apparently they prefer pink or mauve flowers which may explain the strong appeal. I kept an eye on the caterpillar and, a few days later, was extraordinarily fortunate to go out and see it just as it shed it’s skin as it grew. Over the next few weeks, I kept an eagle eye on the caterpillars (there were two of them on different sides of the fennel plant) and watched them grow. I was blessed with this particular pair of caterpillars as they stayed on one plant and didn’t migrate elsewhere. Eventually I was checking them twice or three times a day as they were about 5 cms in length and chubby with it so I assumed they would shortly move to the chrysalis stage. Then we had a few days of very bad weather – cold, rain and strong winds. When that bad weather passed, I couldn’t find either caterpillar. However, I’m a persistent soul and searched along the terrace and was totally thrilled to finally spot a chrysalis firmly attached to a weed about 3 metres from the fennel plant. I kept an eye on the chrysalis – as you would! – and decided that as we had free-ranging chickens at that time, the weed with attached chrysalis would be much safer out of their reach. So I carefully pulled up the weed and put in in a protected spot in the cat cage. I was bitterly disappointed one afternoon when I went out to check its progress and found the empty casing. A bit thrilled too because empty casing and no obvious butterfly remains suggested that the butterfly had successfully emerged and flown off… but I was still sorry I’d missed the moment.